Ah! 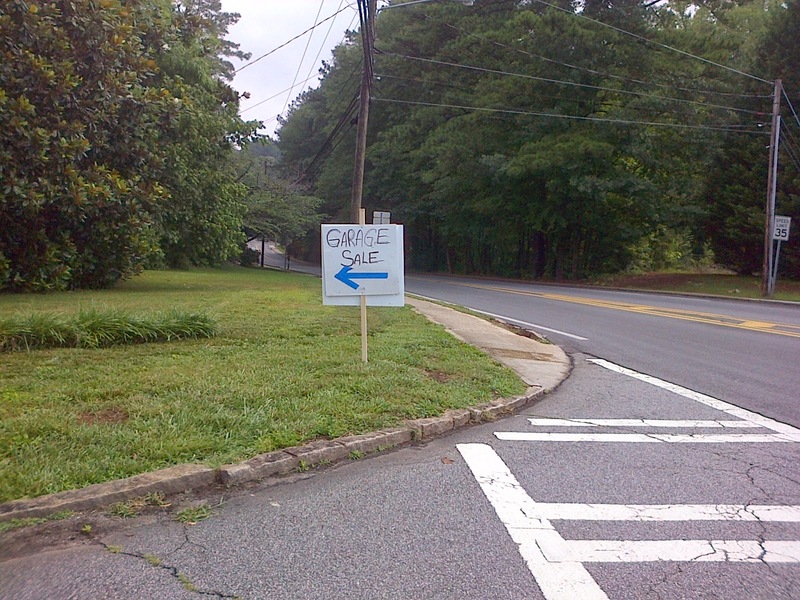 During yard sale season (which runs from March until early November here) a sign like the one pictured brings joy to my heart. 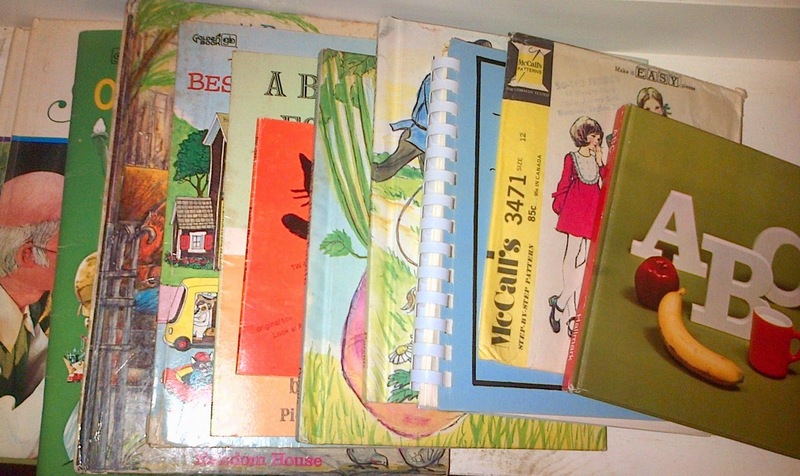 As a vintage seller (children's books, cookbooks, and cards), I shop yard sales for work. The treasure hunting aspect of yard sales is real and fun. 1. This is a great sale, usually either multi-generation, multiple families, or an older person conducting the sale. Vintage items abound! Prices are fair. Items are on shelves or tables and easy to see. 2. This is a good sale with nice things, occasionally something for us, but often things we don't buy - i.e. baby clothes, electronics, CDs, DVDS, etc. 3. This is the sale with boxes of junk pulled out of a basement, broken items, old mattresses. Yikes - how soon can we get out of here?! Most sales we find are 2's on our scale, with perhaps one or two 1 sales on any given day. Those 1 rating yard sales make it all worthwhile. The most amazing sale I ever went to was a multi-generation estate sale, family run, that went on for a whole weekend. I kept going back and back and buying car loads of treasures. This was perhaps 10 years ago -- I bought paper dolls, vintage children's books, vintage toys, and more. I almost purchased a First Edition of Gone With the Wind at that sale. It had a long two page inscription to the original owner from Margaret Mitchell. Just as I was checking out, someone from the family holding the sale decided they couldn't part with the book ... so I lost out. The nicest find I ever purchased at a yard sale was a baseball book called The Splendid Splinter about Ted Williams. I know very little about baseball, but purchased this on a whim for $1.00. I could not find an online reference for it, so I started bidding at $49.99 on eBay. Someone immediately wrote me and asked if I would close the auction for $100. I knew at that point that this was a great find. It sold for over $600 to a baseball collector, and I was thrilled. My most embarrassing yard sale story was when my friend and I were going through a neighborhood and stopping at neighborhood sales marked with balloons on the mailbox. One house had balloons of a different color and style, but we assumed this was just coincidental. There were a lot of cars out front. We went into the garage, which was crowded with great stuff. I took two vintage pictures off the wall. We didn't see a place to check out, so we assumed the sale was inside the house as well (as sales sometimes are). We opened the door ... to find a birthday party being held for an elderly man. It was not a yard sale at all! We were mortified and highly apologetic. We left as quickly as possible. I have many more stories, and more blog posts to come about yard sale adventures! 1. Take small bills. Don't lose out on a sale because a seller cannot make change. 2. If you are purchasing a stack of items, ask for a bulk deal, i.e. "what would you take for this stack?" 3. Be friendly! Be nice! I always speak to the seller as I enter the garage or house, and usually say something nice as well (i.e. "beautiful day for a sale!" or "you have lots of neat things here"). I am chatty and often find that sellers will show me other books that they hadn't put out. I have found some of my best estate lots just by being friendly. Sales have been a little sparser this year. Maybe it's the economy, or the extreme heat and humidity we have had in Georgia recently. The little stack you see below is what I found today: 10 or 12 children's books, a sewing pattern, and a community cookbook. But -- we had fun, and I know there is always next week waiting! This was a wonderful post It brought back memories of garage sales from years ago. When my son (now grown) was young, money was a bit tight and that is how I clothed him and found books and toys for him. Some of those "2" sales would have been treasures for me. I haven't been to a garage sale in years. If I ever become a grandmother, I will use some of your tips - I'll be back to the garage sale circuit, I have a feeling. Alana visiting from UBC. Oh my gosh. That was me you were with when we walked into that birthday party! The folks were pretty cool about it but good Lord it was weird. It honest to goodness looked like a normal yard sale was going on. Trish, what a great blog! I am an amateur when it comes to yard sales. Unfortunately my experience has been mostly junky goods or prices so high one might as well buy new. It would be fun to go to yard sales with you! That birthday party story is priceless, I laughed out loud when I read it! I wonder if anyone else thought the same as you did and entered the house? They should have offered you some cake! Bob, I am not surprised at all that you remember walking into the birthday party! That was a memorable experience. Barbara, if you are ever in the area, it would be fun to yard sale with you! We have a great time.